This is testament to the amazing generosity of the general public. 10 days ago Tillie Mae Mawdsley’s family created a Shareagift Page for her as part of the campaign for MPS Children. Tillie has a rare childhood disease and we’re involved in a campaign with the MPS Society to help raise over half a million pounds for the drug she needs to treat it (please see this blog post for more information). Her parents originally sent the Page out to their friends and family who were hugely supportive and did all they could contributing what funds they could spare. The local paper picked up on her story and ran an article in the Welwyn Hatfield Times. Then something amazing happened. The UK national press got behind the campaign. For all the moaning and groaning we do about the British press, they’re power to influence for the greater good is phenomenal. 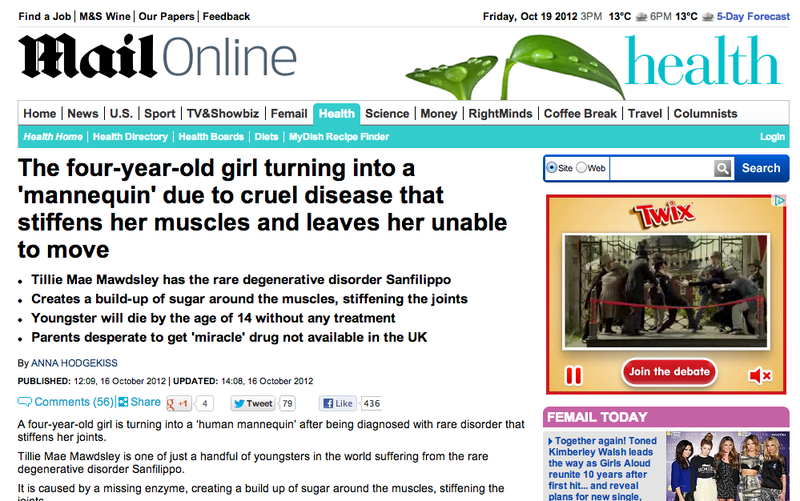 On October 16th The Daily Mail ran Tillie Mae’s story and the public response was overwhelming. Overnight her Shareagift Page received over £2,000 in contributions from members of the public, strangers who had read the article and been touched by the story. The following day other major national newspapers had picked up the story and articles ran in the Mirror, The Sun and the Metro sparking a whole host of generous contributions from people up and down the country wanting to help. Tillie’s Shareagift Page received over £4,000 in contributions in just 72 hours – the most we’ve ever seen for one Gift Page in such a short space of time since our launch. We’re delighted to report that at time of writing, Tillie’s Page has collected £4,618 in contributions from over 300 generous contributors, and the number is rising every day. Follow @Shareagift on Twitter to keep updated on the progress of the MPS Children’s campaign or search for #MPSchildren. Click here to go to Tille Mae’s Shreagift Page. Next PostFriends already using Shareagift for Christmas!